I run a number of Authenticity workshops – each focused on a different communication skill. For many people it’s not always clear the difference between them. 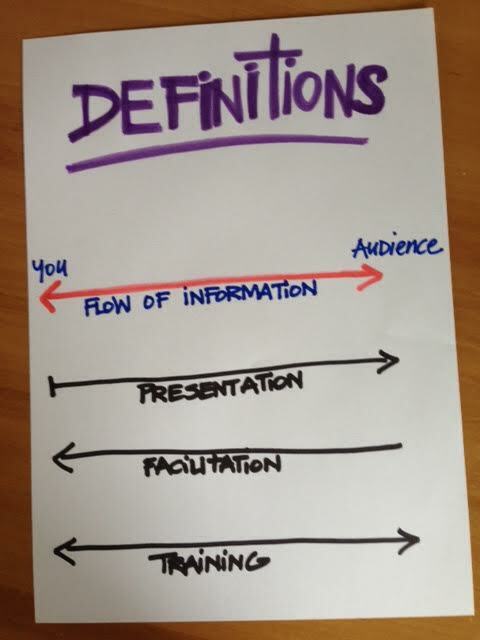 This blog post will share my definitions which are based on the flow of information between you and your audience. It’s important to me that people understand the differences between each discipline as each requires different skills, and has a different responsibility for the speaker. So often I experience trainers who pretty much just talk at their audience. To me, that’s not training, that’s presenting. To present (meaning “to offer”) is when most of the information flows from you to your audience. It’s a useful skill to have, but it isn’t training. It’s one of the things you do when training, but isn’t the whole story. To facilitate (meaning ” to make easier; assist the progress of”) is generally when most of the information flows from your audience to you. The facilitator will help that happen by posing questions or running processes designed to get the audience to generate the information. It’s a key skill for many trainers who wish to help their participants find solutions for themselves. But on it’s own, it’s not training. A trainer uses both facilitation and presentation – with the added responsibility of ensuring that the information that flows between the two ends of the continuum, somehow meet up and fit together. To train (meaning “to change skill or behaviour”) requires us to know when to ask and when to tell. My general rule is only tell when I know they don’t know. I like to let my participants be at the source of the learning; to make their own connections – and I invest much of my time supporting their thinking process rather than downloading information they already know. This entry was posted in Authenticity, Facilitation skills, Training for Trainers. Bookmark the permalink.